A remarkable temporary exhibit, That’s Disneyland, has popped up before a grand auction. It features a large number of artifacts from Disneyland and Walt Disney World’s history. Much of these artifacts are from the collection of Richard Kraft, who has accumulated attraction vehicles and other items from sources such as auctions. The Van Eaton Galleries has done quite a few auctions featuring Disney historical items, but this is the first of a large scale exhibit to precede the auction of the items. It will be the last time all of these are on display together in one place. For many Disney fans like myself, I have been to various archive exhibits by Disney and others that have displayed the history of the first theme park. I’ve been excited about the auction because it’s a chance to have at least one item from the history as my own. But, I’d say that excitement wasn’t as big to go and visit the exhibit. Sure, I like looking at the past of the Happiest Place on Earth, but I feel like I’ve seen much of it in person already. This was all the wrong attitude for the pop up exhibit. One of the striking elements of this gallery are the number of “brownlines” on display. These are concept art drawings with some notes of reference on how to actually build attractions, service vehicles, and decorations for Disneyland. The majority were never built pieces for the theme park, even predating the opening. I was amazed at what was thought up and wished for some of them to be built. For example, as simple as a beanstalk slide would be it had Willy the Giant peering over the top of a cloud. That would have been a breathtaking large scale slide for any kid to play on! It was a bit funny for me to peruse auction items considered to be part of the history, but my fairly recent past. Among such items were old parking lot signs for a lot now taken up by Disney California Adventure. I remember being able to walk from the car straight to the entrance gates, and having to remember where we parked by character name. One of the other times it hit me that my past is now history is seeing little kids take a picture in a Skyway bucket. I still remember riding the attraction up until the closing year, and I realized these young children have no idea of what it was like to have this attraction in the park! To them it’s the fascinating world of a bygone era. To me, it’s a memory. This exhibit has a collection that takes people back in time, and even one’s own past. There are some chances to sit in these vehicles one more time, like I did the Skyway bucket. There is a PeopleMover car, a couple of Rocket Jets, and even a Rocket Rod. It’s a chance to remember the fondness of riding these amazing attractions, and there will be a chance to have them to keep. Something else fascinating about the exhibit is how close you can get to so many parts of the park that were inaccessible in this way before. There’s the organ from the Swiss Family Treehouse that sat behind a fence in a room at the top. But, you can breathe on it now. There’s José from the Tiki Room, working and “talking” but at eye level! Small world dolls gyrate without music, but face to face instead of lengths across. I also loved being able to take long stares at attraction vehicles. There is not enough time to stop and get a good look around them at the park. It was a chance to get some glimpses of mechanisms to how things like the Snow White vehicles and Rocket Rods functioned. The other thing about having things like signs and vehicles at eye level is finding out how large they really are. Up for auction and display is the large D from the former Disneyland Hotel sign that sat at the top of one of the towers. Sure it’s known that it was large to be able to see from a distance, but up close it dwarfs those standing by it! Another surprising thing to see is an empty canoe. I’ve ridden in them, and know they hold a lot of people. To see it on dry land makes me realize how long they really are. Beside it is the old Country Bears Playhouse sign, which sat above what is now the entrance to the Many Adventures of Winnie the Pooh. It seemed like a simple sign, but it really is quite a big display. 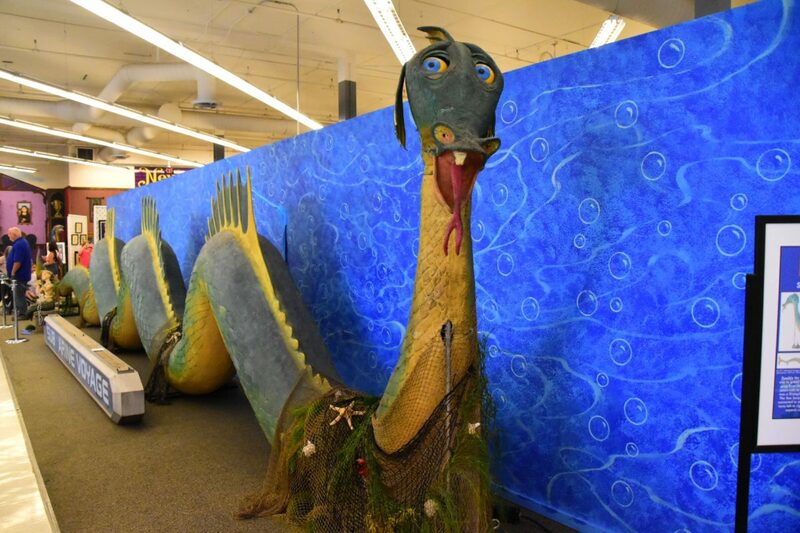 At the end of the whole exhibit is the infamous sea serpent from the Submarine Voyage. In the water and through a small hole in the vessel it did seem big. But, this is huge! It could easily take up a large room in a house. This is a one of a kind exhibit that really shows off the nostalgia of Disneyland. It’s a wonderful collection that will take many back to events and rides that made up childhoods. There are some unique opportunities to get up close and personal and take one last photo with memorabilia. For any Disneyland fan, this is not to be missed! It will only be open until August 25th. For more information check out the auction page at Van Eaton Galleries.